Where appropriate we use a therapy dog during counselling sessions. The dog is specially trained and has passed a health, temperament and suitability assessment to be used as a pet in the therapy room. 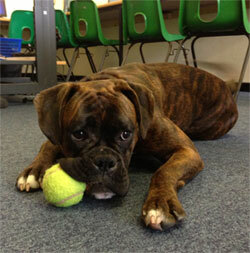 Izzy the dog you can see here is taken weekly in school settings where she is used with children for a variety reasons. Often having Izzy in the therapy room makes such a difference especially when working with children.